We are pleased to welcome Jordan Steckloff, Ph.D as our keynote speaker. Dr. Steckloff is currently an Associate Research Scientist at the Planetary Science Institute as well as a Postdoctoral Research Associate at the Massachusetts Institute of Technology. Dr. Steckloff’s work studies the dynamical, physical, and structural evolution of cometary bodies in the Solar System. He is also interested in the geophysical processes that alter the surface of Pluto and reorient its rotational axis. Dr. Steckloff will share with us some of his planetary insights from two recent articles he published in the prestigious journal Nature. Dr. Jordan Steckloff received his Bachelor of Science degree from the University of Michigan with a triple major in Physics, Economics, and German. He later received his Masters and Doctoral degrees in Physics from Purdue University before joining the Planetary Science Institute in 2016. Lawrence Technological University is located at 21000 West Ten Mile Road, Southfield, MI, 48075. Lunch will be $10 per person at the LTU Cafeteria. A portion of the proceeds helps fund our complimentary breakfast. Give an example of . 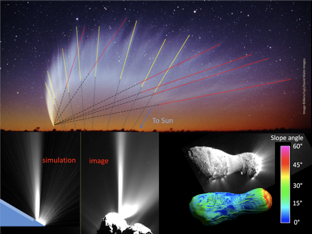 . .
To quote David Levy: “comets are like cats: they have tails, and they do precisely what they want.” They have strange bilobate nuclei, undergo outbursts (rapid, unpredictable brightening events), and form long striated dust features in their tails that somehow align with the Sun rather than the nucleus. Additionally, their dynamics appear to require some mysterious mechanism for reactivating their sublimative activity. In this talk, I describe how all of these features are the result of ice sublimation, the process that defines these irregularly shaped bodies. 2:15 – 2:45 pm Puzzlers! And Door Prizes! This workshop introduces participants to an ongoing project that seeks to connect undergraduate science instruction to the theme of eclipses. The goal of the project is to develop innovative modular, research-based instructional materials for use in a variety of physics and astronomy courses. Workshop participants will gain firsthand experience with selected materials and learn about the underlying research in astronomy and physics education. This effort, part of a collaboration with the NASA Heliophysics Education Consortium, is led by Ramon Lopez (U. Texas-Arlington), Janelle Bailey (Temple/AAPT), and Rebecca Vieyra (AAPT). There are fundamental relationships between electricity and magnetism that are well described in textbooks but how many of us actually have students do these labs and develop these rules by themselves? In this workshop participants will put their hands on the materials and develop two of these fundamental relationships. They will experience some of the inquiry methodologies described in the Modeling Method for Teaching Physics.